​There is absolutely no shame in side stepping the Thanksgiving kitchen madness and enjoying a nice meal from someone else’s kitchen. And where better than some of Brooklyn’s most beloved restaurants? Replace the traditional turkey with some BBQ at Delaney Barbeque or get the full Thanksgiving experience at Sunset Park Diner, just steps from Hotel BPM. What ever you do, enjoy it with loved ones, and a fork in each hand. Happy Thanksgiving everyone! Marlow & Daughters is offering natural, pasture raised, white-breast turkey for $7/lbs. You can also add a complete Thanksgiving sides packages for $120. Thanksgiving desserts can be pre-ordered through Friday, November 20 as well which include apple, pumpkin, pecan, and malted milk chocolate pies for $41-44. A limited supply of Texas-style brisket ($199 for 6-8lbs) and smoked turkey breasts ($129 for 5lbs) are available to order for delivery or pickup on Tuesday November 24th. Free delivery for orders over $250. At Sunset Park Diner you can get a turkey with gravy, stuffing, soup, rice pudding, a choice of drink, and more for just $15. Rose Water Restaurant will have a prix fixe menu from 12pm-10pm for $68 which includes butternut squash soup, grilled octopus, and a smoked turkey leg. Book online for reservations between 2 and 7:30pm. Grab a special late night Turkey special at TALDE this year. From Monday, November 23 through Friday, December 4 from 9pm-closing. They’ll be selling 10 orders of Thanksgiving ramen for $15 at the bar. Orders sell fast so try it ASAP! 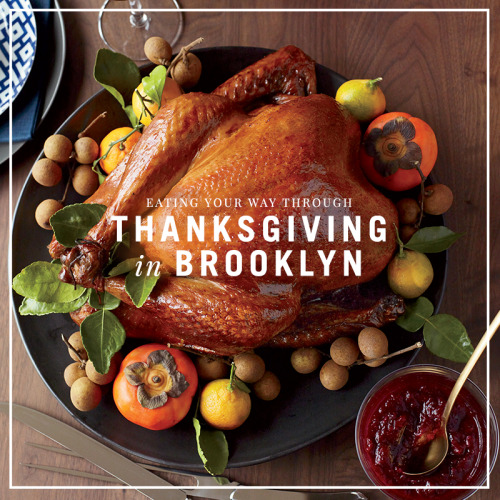 Enjoy a delicious & traditional turkey dinner prix fixe menu from 1pm-8pm for $85 ($42 for children). Choose between turkey, brook trout or Prime rib with traditional sides for an entree. Just $38.95 per person ($20.95 per child) for a three-course meal at Marco Polo Ristorante. There’s plenty of entrees and appetizers to choose from including a traditional turkey plate. Henry’s End will be offering a Thanksgiving themed a la carte menu featuring pretzel crusted shrimp, and roasted all natural turkey with all the trimmings. A three-course prix fixe menu is available at James for $85 which includes seared scallops with delicata squash, roasted turkey legs, and pumpkin cheesecake with cinnamon creme fraiche. Check out Fat Goose for a traditional turkey plate, fish dish, and vegetarian option will all be available, just for $65.